Philips has added a new member to its Xenium series with new slider phone named as X650, which features cool stylish metallic keypad and long-lasting battery. 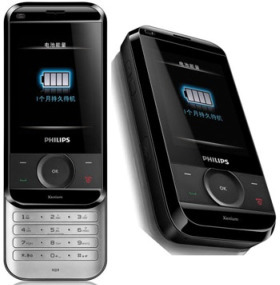 The new Philips X650 slider phone has an impressive battery life which capable of lasting up to 8 hours in talk time or 720 hours (one month) in stand-by mode. In addition, the phone also comes with 3.2 megapixel photo snapper with autofocus function, FM radio, Bluetooth connectivity and USB port. Furthermore, it also integrated with 30MB of internal memory which be able to expand by using micro SD memory cards. The new slider phone also supports Tri-band GSM (900/1800/1900MHz) and GPRS connectivity. The new Philips X650 slider phone measures just 104.5 x 52 x 16.75 mm and weighs only 133.9 grams. Unfortunately, the price and launch date have yet to be announced.